"Certain Uncertainty in the Digital Era"
Headliners: Erlan Ospanov, successful businessman, CEO of Verny Capital Group. Dr. Patrick Duparcq, Dean of Nazarbayev University Graduate School of Business, Professor and successful online marketing guru shaping the ideas and views on online marketing. Dan Price, Storytelling Director at Interactive Schools, a global speaker, and a champion for the use of social communications within schools. Erlan is the Founding Partner (2006) and Chief Executive Officer (2013) of Verny Capital Group with extensive experience across wide range of sectors, such as investments, private equity, corporate finance, financial modeling, capital markets, asset management, real estate development, business valuation. Before he worked as Deputy General Director of ATF Group in Kazakhstan and Deputy Treasury Director in Halyk Bank. His career path started in mining industry with gold trading, processing and refining as well as pre-export financing. He graduated from Bauman Moscow State Technical University (robotics), KIMEP University (finance) and University for International Business (MBA). Dr. Duparcq is a recognized technology strategist and technology visionary with twenty years of expertise in technology forecasting, marketing, and technology implementation. He has a track record of “predicting and planning for the next wave”. Over the last 20 years, Dr. Duparcq’s expertise in technology and marketing has helped companies to develop a digital strategy and implement technology in several business functions; he has helped some of Europe’s top business schools in positioning and globalization; he has also provided advice to federal, regional and local governments. In a 2008 book “Online Marketing Heroes” (Michael Miller, Wiley Publications), Dr. Duparcq was selected as one of 25 successful online marketing gurus shaping the ideas and views on online marketing. Ian sits on a number of boards in the UK and the Middle East. He became Chairman in 2017. He is a former investment banker, headmaster of a leading UK independent school, and CEO of the oldest and most respected education consultancy in the world. Ian has led on international educational school projects globally and is a regular contributor to global education debates in the UK National and International press such as The Times, Financial Times, The Telegraph, and Huffington Post. Dan is the Storytelling Director at Interactive Schools, a global speaker, and a champion for the use of social communications within schools. Dan believes in content authenticity, as this underpins meaningful and inspiring storytelling. Every school is different (and amazing), where each individual learning journey is varied and intertwined. Dan wants to help every school capture these stories in an effective way. Dan works with schools around the world, helping deliver content strategies that are shared, talked about, and loved. A self-confessed 'social junky' – Dan immerses himself in new social technologies – so that deeper understanding can be shared with the wider education community (as it is moving so fast!). Gail is an entrepreneur and has been involved in education consultancy for 10 years. She most recently developed education software, in partnership with the Youth Sport Trust (YST), in the UK. This programme was a digitally delivered assessment of the whole child based on unique, educational content developed by the YST and distributed in over 1000 schools in the UK and internationally. She has a BSc in Civil Engineering and an MSc in Internet Programming. Gail educated her four children at Haileybury UK over 15 years and was Chair of the HPA (Haileybury Parents' Association) for four years. She is an honorary member of Haileybury’s Alumni organisation, the Haileybury Society. Educational consultant. Dragonfly Training's in Thailand. Formerly Head of Upper School at Harrow Bangkok, and currently an educational consultant, Denry has considerable experience of schools operating in diverse and competitive contexts, particularly in Asia. Focussed on business thinking within education, his PhD led to publications on the economics of international schooling, organisational evolution and school marketing. Denry has written several business textbooks, including co-authoring the best-selling DK ‘Business Book’. His popular blog focusses on school strategy, marketing, admissions and the challenges of Headship. Denry also lectures for Keele University on their MBA and PGCEi programmes, serving also as a Governor at a start-up international school in Malaysia. Chief Communications Officer at Verny Capital Group. Olga has 20 years of experience working in Communications and Public Relations in senior positions in public and private sector in Kazakhstan (InterContinental hotel chain, Asian Development Bank, UK Foreign & Commonwealth Office). She is an Accredited Practitioner and Member of the Chartered Institute for Public Relations, UK having also graduated from Robert Gordon University, Aberdeen, as a Master of Corporate Communications and Public Affairs. In her current position as Chief Communications Officer at Verny Capital Group, she is responsible for corporate and public relations, and supervises marketing communications of the group’s companies. As Finalsite's International Marketing Manager, Debbie has worked with international schools for the past 9 years while living in both Asia and Europe. She holds a Master’s in Education Technology and is passionate about using technology both in and out of the classroom. As an expat herself raising 3 children in international schools, she has a keen insight into the needs of prospective families on their journey through an international school. In working with schools around the world, she helps them understand how they can maximize their online presence, increase community engagement and meet their marketing goals. In her free time, she enjoys traveling and attending events at her children's school in Berlin. Charlie began his career in 1994 as an intern working in feature films in the USA. Initially working on low budget features before moving onto 20th Century Fox’s Independence Day in New York. Since then Charlie has produced over 100 hours of documentary and drama for C4, ITV, BBC, Five, UKTV, Crime and Investigation and Animal Planet whilst managing Eye Film. In 2012 Charlie established a unique education scheme in the UK forming the country’s first ’Learning Company’, where students work 9-5, 5 days per week whilst studying for a Diploma. Working on professional briefs the students produce content for real clients, to real deadlines. He now employs several of his graduates. Throughout his career Charlie has worked with students, schools and colleges to find, nurture and create the next generation of filmmakers. He now runs short training courses for staff and pupils on how to create video content. John Medlicott (@johnmedlicott ) is the Director of JMC Education, the consultancy group whose unique bespoke approach to CPD has led to them being in high demand in schools and colleges across the UK and the world (www.jmcinset.com ). JMC is a particularly familiar name in the independent and international sectors, where they are highly regarded and support numerous associations such as COBIS, ISP, SATIPS, ISA and IAPS. He previously held several key academic and pastoral leadership roles in schools and colleges. John still teaches in an Ofsted Outstanding School and has taught Science for over 20 years. As a teacher trainer & school improvement consultant he works with schools across the UK and internationally. He is consistently graded as “outstanding” by delegates on their evaluation forms. John is a regular Keynote speaker and workshop provider in School Leadership, Marketing and Teaching and Learning. With expertise of more in the Management, Marketing and Cross Cultural Communication fields, he has exercised consulting and training as the paths to deliver the message to focus on the few and not the many and to work really hard to achieve relevant goals. Via his teachings, he has changed the lives of many in three different continents for more than 27 years. Some of the countries where he has worked are the UK, Spain, Kazakhstan, Mexico, France, the US and Italy. This international experience includes work with both the private and public sectors across multiple industries (retail, education, oil and gas, media, car, hospitality and service) for companies like PepsiCo, GE, Cisco, Kraft, Land Rover, Lloyd's Register, Chevron, BP, Walmart, IBM, Nissan, Baxter, Arvin Meritor. Regarding education, he has been a passionate language teacher and is now working towards getting his PhD degree with focus on the teaching practices at mixed-age groups in rural ungraded schools. For close to two decades, Max Eisl has worked with schools in various capacities. For the past nine years, he has consulted with international schools on technology, including managing student information, enriching online learning, and optimizing online communications. Prior to his technology consulting career, he was both a classroom teacher and a dedicated school principal. Born in Austria, Max lived in Germany and The Netherlands before settling in the United States. He is a frequent speaker at conferences and workshops around the globe sharing his expertise and vision on digital marketing and communications to enable schools to Recruit, Retain and Engage their community. He holds a B.S. in Chemistry/Comprehensive Science/Secondary Education and M.A. in Educational Leadership and is the proud father of three boys. Registrations are made on the COBIS website. Follow this link to register your place at the conference. For those travelling on Air Astana, you have a free of charge use of the preferential MySeat product. Please email to marketing@airastana.com your booking reference and they will arrange the FOC MySeat. Take a tour of this beautiful city with a hop-on-hop-off red bus tour that will take you to the National Museum of Kazakhstan, Palace of Peace and Reconciliation, Baiterek Monument, Khan Shatyr, Mega Silkway/Expo and Triumphal Arch. 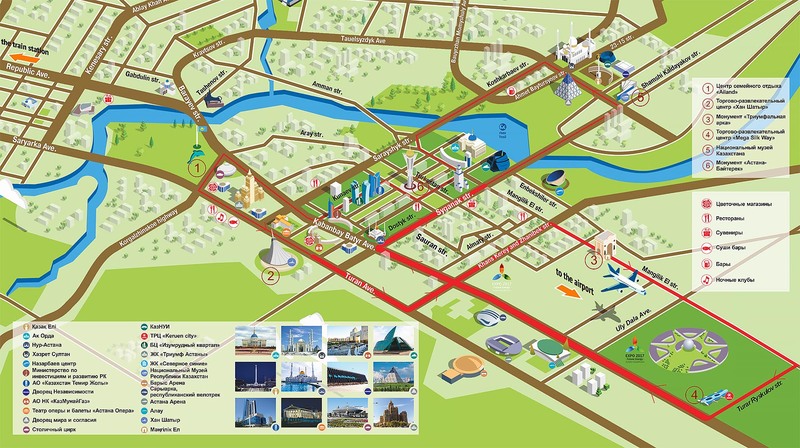 Tickets for the 'hop-on-hop-off' Red bus tour of Astana can be booked online directly with the provider, simply follow the link above 'Book a City Excursion'. If you have any questions you can ask the provider or email the conference organisers via p.silvanus@haileyburyastana.kz who will be happy to help you. The bus can pick up from outside the Khan Shatyr Mall, a 5-minute walk from the Marriott Hotel. We recommend a visit to the Expo park, where there is an excellent future energy museum in a fantastic building with views across the city. 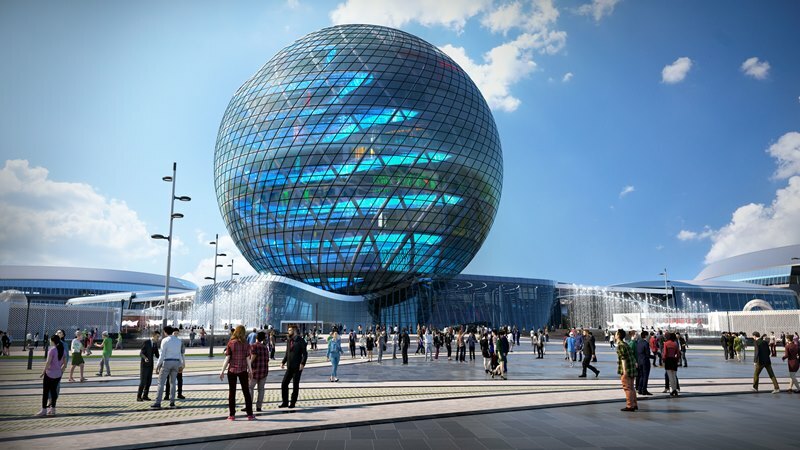 EXPO 2017 was hosted in Astana and today the facility holds a really interesting museum on future energy with many interactive exhibits on each of the 10 levels. We highly recommend a visit. It sits next to a shopping mall and food court. You can arrange a taxi to the site for approximately 3-4 Euros from the hotel and entry is 7-8 Euros. A visit to Astana absolutely must include a visit to the Baiterek. Enjoy a drink 97m up the 105m tall monument and from your 360-degree view, choose where to head to next; the president’s palace (‘Akora’) or the Khan Shatyr (the largest tented building in the world). This is also one of the stopping points on the hop-on-hop-off bus route. It’s easy to explore the city by foot, and if you need a lift somewhere taxis are easy too. The monument is meant to embody a folktale about a mythical tree of life and a magic bird of happiness: the bird, named Samruk, had laid its egg in the crevice between two branches of a poplar tree. We will bring you options for other events in the coming weeks as and when schedules for performances and events are published. You can check here for the performance schedule at the Astana Opera. Haileybury Astana has negotiated reduced rate accommodation for the duration of the conference at Marriott Hotel, Astana. This rate includes breakfast. There are 55 nationalities that can enter Kazakhstan to attend this conference without the need for a visa. Check out the information in the visa information file below. If your nationality is not on the list, we can help you obtain a visa. If you have any questions about obtaining visas, please get in contact with the event organisers, p.silvanus@haileyburyastana.kz, who will be happy to help. Visas requirements are based on the passport you hold as opposed to the place from which you will be travelling.